As the Greek debt crisis came to a head again earlier this summer, it's no surprise that leaders in more solvent eurozone countries expressed doubts about Greece's participation in the monetary union -- but these doubts are also widespread among Greeks themselves. A majority of adults in the country -- 55% -- said in a poll conducted May 14-June 16 that they think converting from the Greek drachma to the euro in 2001 has harmed Greece, while one-third (34%) said the common currency has benefited the country. In general, do you think changing this country's currency to the euro has benefited or harmed Greece? A question on EU membership shows the opposite result. In general, does membership in the European Union benefit or harm Greece? 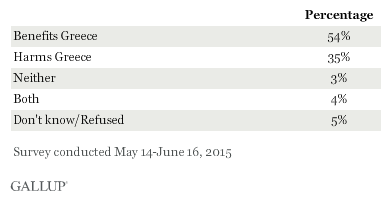 The curious thing about the first poll is a huge majority of Greeks have said they want to stay on the euro. Perhaps we need a new poll.